Burgher arms are coats of arms borne by persons of the burgher social class of Europe (usually called bourgeois in English) since the Middle Ages. By definition, however, the term is alien to British heraldry, which follows other rules. Although the term burgher arms refers to the bourgeoisie, it is often extended also to arms of (Protestant) clergy and even to arms of peasants. In several European countries, the use of armorial bearings was restricted to a particular social class, e.g. the use of supporters in Great Britain, tinctures in Portugal or coronets in Sweden. In other countries, every individual, family and community has been free to adopt arms and use it as they please, provided they have not wrongfully assumed the arms of another. Use of coats of arms by burghers and artisans began during the 13th century and in the 14th century some peasants took to using arms. The arms of burghers bore a far wider variety of charges than the arms of nobility like everyday objects, in particular, tools. In burgher arms are met sometimes also house marks which are not met in arms of nobility. Most widespread burgher heraldry was and still is in Switzerland and in the Netherlands. In the Netherlands only a small percentage of the existing arms belong to the nobility. Crest-coronets in burgher arms are correct only if the arms were granted by a sovereign and the coronet is explicitly mentioned in the grant. Although assumption of arms always remained free, the emperors of the Holy Roman Empire since Charles IV began to grant arms without raising people to nobiliary status. 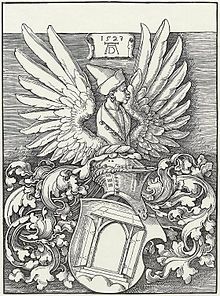 In the 15th century the authority to grant arms was delegated to “Counts Palatine of the Imperial Court” (German: Hofpfalzgrafen), who from then on also granted arms to burghers. This was regarded as luxury everyone was not able to afford. The tilting helmet was prescribed for arms of non-nobles, while the barred helmet was restricted by the imperial chancellery to the nobility as upholders of the tradition of tourneying. This privilege was also shared by certain people who enjoyed the same standing as the nobility, e.g. those who had a doctor's title in law or theology. Custom of the use of the barred helmet was also followed by city patricians. Although the rule of the use of the tilting helmet by burghers was not always obeyed, it has still become the norm in many countries of the German-Nordic heraldic tradition, e.g. in Swedish heraldry. After the fall of the Holy Roman Empire, arms were no longer granted to burghers except in the Kingdom of Saxony, where such grants continued from 1911 until 1918. Elsewhere burgher arms were assumed. 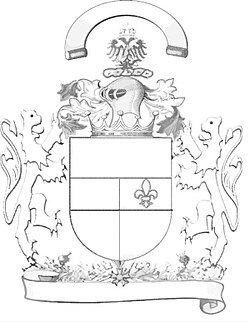 Such family heraldry is still alive in Germany and burgher arms are protected by law. Burgher arms used to be common in France, but they disappeared in the French Revolution, which was hostile to heraldry. In the end of the 17th century, an attempt was made to list all arms in Armorial général as a device to increase tax revenue. When the attempt failed, in order to force people to pay tax, arms were given to many burghers who had never had them. These arms were never used by their recipients. In France burgher arms are not supposed to have a helmet. Burgher arms had a complicated and suppressed history in Portugal. During the reign of King Afonso V, burgher arms were restricted to the use of colours only. This restriction would become irrelevant when King Manuel I forbade the use of arms to those who were not of the Portuguese nobility. This restriction against burgher arms in Portugal lasted until 1910. In some regions (Normandy, Flanders) even peasants sometimes bore arms. In Switzerland 14th century arms of farmers are known, but they are rare and did not become numerous until the 17th century, as well as in Lower Saxony, Frisia and Tyrol, where farmers had personal freedom. In Denmark arms of farmers are preserved on seals from about 1300. In Norway peasants have used arms since the Middle Ages and some of the arms have even been used as family arms. ^ Michel Pastoureau, Heraldry: Its Origins and Meaning, 'New Horizons' series. (Thames & Hudson 1997), p. 14. ^ Hans Krag: Norsk heraldisk mønstring fra Frederik IV's regjeringstid 1699-1730, Bind II Bønder, (1942 – 1955) and Allan Tønnesen (ed. ): Magtens besegling. Enevoldsarveregeringsakterne af 1661 og 1662 underskrevet og beseglet af stænderne i Danmark, Norge, Island og Færøerne, Odense 2013. Look up burgher in Wiktionary, the free dictionary.